Visiting my parents in Buffalo for the weekend, I couldn't resist two treats unique to the area. 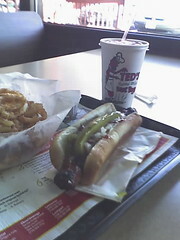 Friday for lunch, Mom and I stopped in at Ted's Hot Dogs on Sheridan Drive. They cook dogs from Sahlen's to perfection-- crispy and bursting-- over massive indoor charcoal-fired grills. Grandma used to tell them "grill mine black." Mom had one dog with their chili and famous hot sauce, I had one with everything except mustard-- hot sauce, relish, onions, and pickles-- and extra hot sauce to boot. A side of onion rings had a medium-dark finish, with a good amount of batter-- sometimes they're darker and crispier, sometimes lighter and fluffier. I had a traditional loganberry soft drink with my lunch. Ted's (and everywhere else in Buffalo, it seems,) serves Aunt Rosie's Loganberry, a brand distributed by the local Pepsi Cola Bottling Co. Sadly, it lacks the tartness of the old, Canadian loganberry syrups which were prevalent before the "Aunt" takeover-- there was never an Aunt Rosie, but there was a Ted! 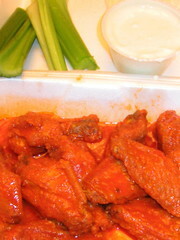 For dinner last night, I picked up a single order of wings (medium) from Duff's on Sheridan at Millersport. The two big schools of wings are The Anchor Bar, where Buffalo-style wings originated, and Duff's-- we've always been Duff's people. Wings are wings, and there are good ones everywhere, but like cheese steak sandwiches and pizza, the subtleties make all the difference, and it's correct to get passionate about these things. 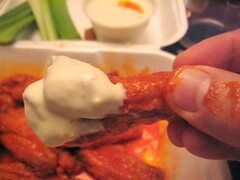 All I ask is that you call them "Buffalo-style" wings or just "wings," not "Buffalo wings"!